The Certified Service Management Process Owner (CSMPO™) course aims to increase the knowledge, skills, and competencies of service management process owners in order to best prepare them for their role and responsibilities. 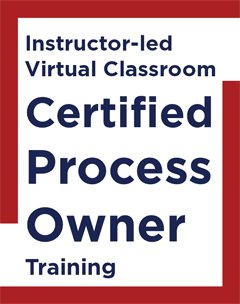 Process owners gain a wealth of hands-on experience and practical knowledge during the CSMPO course that is highly interactive and filled with practical assignments and materials that can readily be applied. Successful candidates passing the 90-minute exam will receive INTERPROM’s Certified Service Management Process Owner (CSMPO) certificate; an internationally recognized confirmation of service management process owner knowledge and skills. Those who have RSVP-ed will be notified when this course has been confirmed. Upon confirmation you will be provided with a link to make an online payment. The fees per student are: $1,695. Fees include exam fees and shipment costs of course materials within the Continental US. A surcharge will apply when shipping internationally. What does a process implementation plan or process improvement plan look like? How to align a process with business and service management objectives? How to integrate processes with other processes and with services? How to show return on investment on process improvements?